Amusing musical drama set in the early 1900s when the Music Hall scene reached its peak of popularity, and superbly directed by Val Guest. At the turn of the 20th Century Bob Fielding (Michael Rennie) arrives in London determined to make it as a song publisher. He visits a music hall where he hears Edie Story (Margaret Lockwood) singing 'Oh, Mr Porter' and immediately falls for her. He acquires the rights to the song I’ll Be Your Sweetheart and asks Edie to perform it, only to find that rival publisher, the sauve Jim Knight (Peter Graves) also claims the rights. Despite Jim’s claim, Bob turns the song into a huge success and begins to realise his dream of being a successful publisher. However when music publishing pirates threaten Bob’s business he has to fight back and only when a new copyright law is passed into law does he have a chance to rebuild his fortunes both as a music publisher and as Edie’s partner. The film includes performances of the famous music hall songs, ‘Mary-Anne’, ‘The Honeysuckle and The Bee’, ‘Oh, Mr Porter’, ‘I Wouldn’t Leave My Little Wooden House For You’. 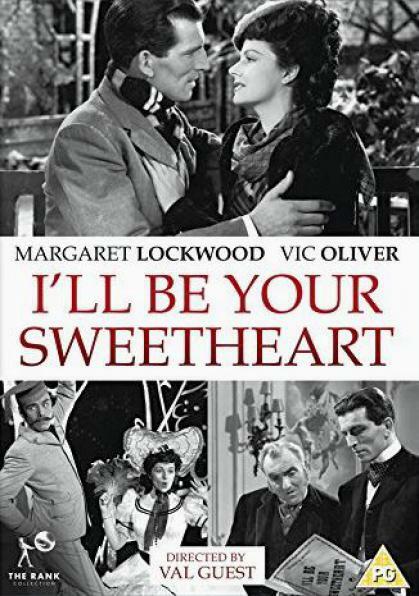 Featuring: I’ll Be Your Sweetheart (1945).